President Nicolas Maduro averted major dissent and consolidated his leadership over Chavismo during the Socialist Party’s (PSUV) Congress (25-31 July 2014). In recent months, it looked like the Congress might provide a public spectacle of in-fighting and ideological divisions. However, the Maduro government was able to present an image of unity and is now in a better position to push forward with economic reform. The government of Maduro continues to have a constant approval rating around 40% in the polls, remarkably high given the depth of the social, political and economic problems the country is suffering. After 7 days of deliberation the PSUV made public thirty two resolutions. Some had been agreed upon before the congress, such as designation of Nicolas Maduro as President of the Party (res. 2). Others were actually developed during the congress, for example the ones that refer to the fight against corruption, bureaucracy and the reorganization of the state (res. 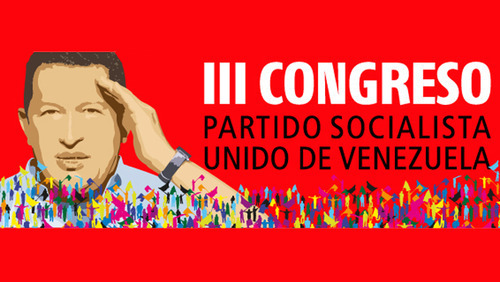 12,13, 17) and the bases’ request for the PSUV to further delineate its ideology (res.18). The issue of the ideological formation and stance was persistent during the entire six days, with the bases pushing for the creation of an ideological training school for PSUV leaders and members. Maduro accepted the proposal and said it will start in November. PSUV members also asked President Maduro to create a commission to prepare a proposal containing the methodology, objectives and aims of a Chavista socialist project (res 18). It is striking that the bases asked for further definition of Chavismo given the number of documents and plans emitted the last 15 years. The “social” dimension of the Bolivarian Revolution was reaffirmed (res 15 and 16); as was its anti-capitalistic, anti-imperialist, socialist (res 27 and 28) and civil-military character (res. 23). The conflation between state, government and party characteristic of Chavismo was frequently on display. For example, the same resolution (18) refers to the ideological formation of PSUV’s members that want to exercise political duties inside the party or inside the public administration. Other resolutions outline the new relationship between the party’s directorship and the bases. It was agreed that the directorship and the bases will establish an interactive communication and that the bases will function as a form of social comptrollership of the party’s directorship and help the government to execute the Plan de la Patria (res, 9, 10). Resolutions 21 and 22 set a timetable for the renovation of the PSUV’s directorship. It provides a 6 month framework (until the 28-01-2015) with a bottom-up procedure (not specified in the document). But it should be noted that Maduro is now elected President of the Party for the following 4 years and he designates the first vice-president and regional vice-presidents. Very little was said about the economy. Emphasis was given to the efforts needed to increase productivity in the country and overcome dependency. Party members also promised to fight the economic war that they see being waged against the Maduro government (res. 11, 13 and 14). While Maduro was clearly fortified by the successful Congress, the “collective” character of the leadership in his government was also reaffirmed. During the Congress some participants publicly requested that Diosdado Cabello should continue as the first Vice-President of the party, putting event organizers in an awkward position (the Vice President is supposed to be designated directly by the President, not the bases). Observing the procedures of the congress it was clear that Cabello was in charge of the event and had a strong following. President Maduro seems to have accepted this reality and on the last day named Cabello to this position (It is an important position because the VP heads the party’s powerful National Political Directorship). Maduro created some new positions (that are not subject to popular mandate) in the party in order to accommodate some other important figures of Chavismo. Ernesto Villegas continues to gain importance, becoming Vice President in charge of the Party’s public relations. Governor of Carabobo State, Francisco Ameliach, will be in charge of the party’s electoral commission that will organize the electoral procedures for the renovation of the PSUV’s directorship. Blanca Eekhout (the first Vice President of the National Assembly) will be in charge of the PSUV and other Gran Polo Patriotico inter-party relations while Maria Cristina Iglesias and Elias Jaua (ex minister and coordinator of the III PSUV Congress) will direct the ideological and international aspect of the party respectively. Issues related to business nationalizations and land reform were almost non-existent. Some insiders suggested these strategies did not achieve their goals and that even high level Chavistas have a critical stance about the nationalization process. This could indicate increasing willingness to work with the private sector. Furthermore, most of the participants expressed support for Maduro’s recent economic decisions and there was no discussion of former Planning Minister Jorge Giordani’s recent criticisms. Insiders suggest that the PSUV sees China as the economic model to follow. Indeed relations with China have become ever closer and a number of PSUV’s members will go to China for ‘ideological training’ in the coming months. The most prominent critical current within the PSUV Marea Socialista (MS) did not managed to put its agenda in the Congress; most congress participants seemed to have no knowledge of MS’s proposals and preferred to avoid any controversial issues. One member of MS suggested that its ideas were expressed in private but did not make a big impact inside the congress. In any case, MS does not have big differences with the leadership’s ideas but criticizes how these plans are being executed. On the last day of the Congress Maduro announced the government will start a national dialogue about an increase in gas prices. He suggested the government would use the resources stemming from any increase for social programs. PSUV’s members accepted this announcement with applause, no small achievement given that gas prices have been the third rail of Venezuelan politics since an increase in 1989 precipitated three days of rioting and looting. Maduro promised that he will make important announcements in the coming weeks. With Venezuelan oil price dropping to its lowest monthly average (August, US$ 92 per barrel) in eighteen months, reforms are becoming all the more urgent. Maduro also announced that in November the government will hold a conference regarding the economy where many national and international actors will participate and important decisions about the country’s course will be taken. Dimitris Pantoulas is a Caracas-based political consultant.